Medford, NY (April 10, 2019) – Around 6:00 a.m. on Wednesday, April 10th, police were stated to have responded to a call concerning a woman who was struck by a vehicle that then fled the scene. The accident happened along Norfleet Lane, according to authorities. Police stated that 30-year-old Olivia Thornton, who is currently believed to be homeless, was sitting by the side of the street when she was struck by a vehicle identified as a dark-colored pickup truck. It is possible that Thornton was further in the street than she should have been, since other drivers were reported to have driven around her. However, the driver who struck the victim committed a criminal act once they fled the scene. Emergency medical crews responded to the scene where they transported Thornton to a nearby hospital, where she had to undergo several surgeries for serious injuries. Anyone with any information on the driver involved is being asked to contact Suffolk Crime Stoppers at 1-800-220-TIPS. Our most genuinely sincere sympathies are wholeheartedly extended to Olivia Thornton, first and foremost, as we preserve hope for her full recovery. 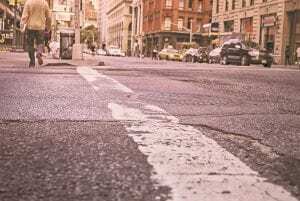 Pedestrian accidents in New York are often injurious or fatal, as there is absolutely no protection between a vehicle and a person at the time of impact. At this time, it is important for the victim to know that they may have significant rights regarding compensation for their injuries. Our New York accident attorneys at Hach & Rose have committed their lives to those who have suffered due to the actions of a negligent party or other entity. We understand that there is nearly nothing as overwhelming as a sudden injury and we are here for you 24/7 to answer any questions you may have. If you or a loved one has been hurt in a New York pedestrian accident, please do not hesitate to call 212-779-0057 today.